The French never planned on how long the invasion might take, but the stalling tactics of the Russians led the French to lose horses to exhaustion and broken wagons from the terrible dirt roads. The French also didn’t dress their troops for the winter, not having any coats or boots to stay warm with. They also struggled to live off the land like they normally did because of the scorched earth tactics of the Russians and the sparsely populated land there. This invasion has been taught as a case study for how important planning is for invasions from that moment on. Once Napoleon realized that he was stuck in Russia with no way to win, he started to contemplate the best ways to retreat from the country. At that time he learned that General Claude de Malet attempted a coup against him in France, so he abandoned his men and returned home quickly. Actually leaving on a sleigh so that he could return as quickly as possible to stop the revolt against him. forced to take the worst possible route out of Russia, one that would have no food or supplies for them to use. The situation became quite dire for the French as they retreated, losing more men to starvation, sickness and suicide than all other battles combined. The horses would become the main source of food to the men when temperatures dropped to -30 (because there was no grass for the horses to eat anyway). Some sources even claim that there were issues with cannibalism among the French, although it is still a debated subject among historians. The French would lose 380,000 men to various causes of death, and another 100,000 captured, during their retreat from Russia. Only about 20,000 would make it back to France, a number which would not include the allies who went home on the way back. Although this was not a one sided battle since the Russians lost nearly 150,000 troops in battle and hundreds of thousands of civilians also. These numbers made this one of the most deadly invasions in the history of the world. This gigantic mistake would become the turning point of the Napoleonic wars and would ruin the strength of the French army. This caused the rest of Europe to be completely convinced that Napoleon was beatable, and they would unite in numbers not seen prior to this. Many European states that had been allies of the French would break their allegiance to help in the attack. 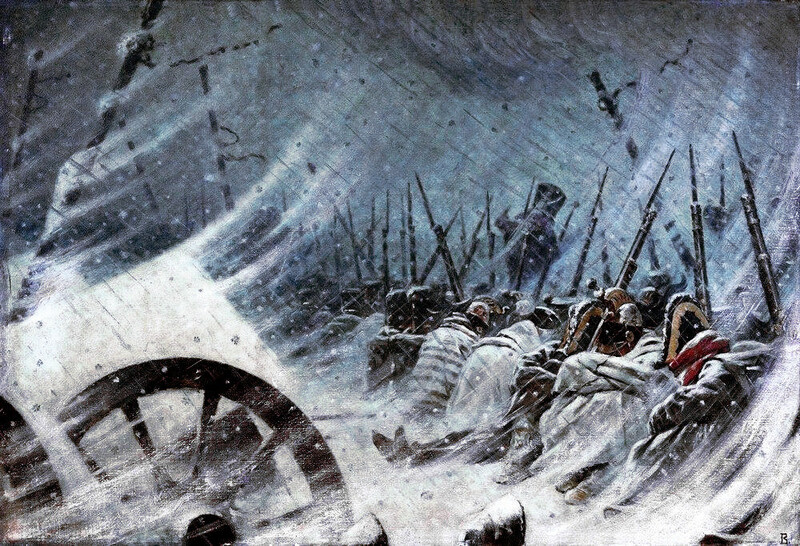 This invasion would also become a well-known historical occurrence that is referenced in a number of outside sources like Tolstoy’s ‘War & Peace’ and Tchaikovsky’s ‘1812 Overture.’It is also taught by many military academies as a cautionary tale for both the need of supplies to the problem of fighting two front wars. Not finishing the war in Spain before starting war with the Russians is seen as one of the major tactical mistakes of Napoleon. This website was created as a way to get content to my students that is more in depth than textbooks can provide, but is as historically accurate as can be. I have been horrified in recent years at the level of misinformation that can be found online with regards to history. This website is my best effort to give content that is factual, in depth, and is written in a manner that students understand.